January 30, 2018 – Fort Russ News – Paul Antonopoulos – Translated from Descifrando la Guerra. 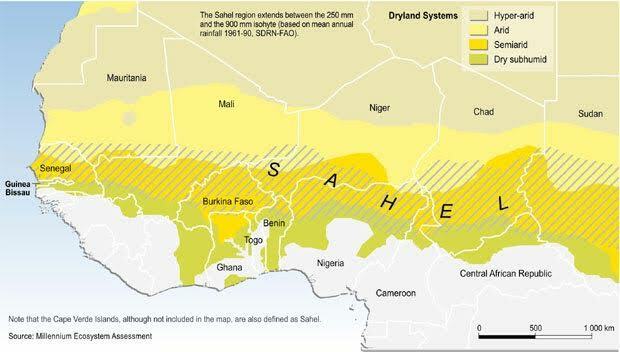 Located between the Sahara desert and the Savannah, the Sahel is a strip of land in Africa of several million square kilometers, and although they are sparsely populated, the course of events suggests that in the short term they will be the scene of a large-scale confrontation between the national armies of the states that make up this geographical region, ethnic and tribal militias, jihadist groups and common criminal networks. Populated since Antiquity, the Sahel has been the cradle of great and rich empires that have succeeded one another in time, such as the Shongay, the Emirates Fulanis and many others. All this power and splendor was given a blow when the colonial powers collapsed on the territory imposing to them a culture and some forms of government that were alien to them. After a century of plundering their natural resources the colonial powers, basically France and the United Kingdom, left the territory leaving behind an educated elite to continue leading a few states whose borders had been drawn without being based on historical or ethnic criteria. This in the end has been a permanent source of conflict. These countries that emerged from decolonization are characterized by a large territorial area, a predominantly rural population, who practice a subsistence economy due to the continuous progress of desertification and governments unable to exercise their sovereignty in the whole territory, creating porous borders for which smugglers, traffickers and jihadists roam freely. As a result of these conditions of life, clashes between different ethnic and tribal groups have been plentiful for decades due to the disputed few useful land available to practice agriculture or livestock/grazing, along with arable land. Another source of conflict has been the control of natural resources whose exploitation supposes a substantial part of the state revenues of countries like Niger, being the drug trafficking and more recently of people and weapons, a resource like others to survive extreme poverty. 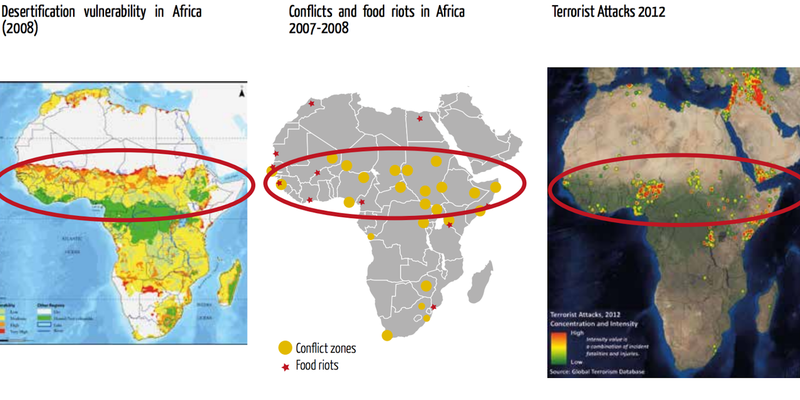 If, for decades, interethnic relations have been complex in the region with perpetual civil wars in Sudan and Chad, and recurrent Tuareg uprisings in Niger and Mali, to force the development of their territories or to segregate to form new states, it is with the irruption of jihadism in the Sahel, when relations between different ethnic groups and tribes have been transformed, as a result of the instrumentalization of groups such as Al Qaeda or the Islamic State of the atavistic clashes between nomadic and sedentary societies for the control of wells and arable lands or between clans the control of contraband routes, in order to be implemented in the area. The result of this adaptation of organizations such as AQMI, Mujao, Al Morabitum or Ansar Dine to the complex dynamics of countries like Mali allowed them to instrumentalize a national liberation movement from the north of the country to establish an Islamic emirate in a territory similar to the sum of Portugal, Spain and Italy, threatening to advance on the capital of the country, being the fear of France and the surrounding countries that Azawad and perhaps all of Mali became a terrorist base from which to destabilize the entire Sahel. Despite the fact that Operation Serval, created to eradicate the jihadist stronghold that Azawad supposed, quickly succeeded in recovering 800,000 km of territory in a matter of weeks, the time in which AQMI, Mujao or Ansar Dine controlled northern Mali. It served to strengthen relations between the different groups that over time have supposed their union in a new organization called Jamaat Nusrat ul-Islam wal-Muslimin (JNIM), distribute the arsenal plundered by the Tuaregs to the Libyan army and serve as a training ground for the different groups that have sown violence Tunisia, Libya, Nigeria and Chad. If Operation Serval cornered the jihadists in the mountainous area between Algeria and Mali known as Adrar de los Ifoghas, they were not long on the defensive and in a few months they had overflowed into Operation Barkhane (Serval’s successor) launching continuous attacks against its components, pro-Bamako tribal militias and the MLNA. On the other hand, that academy of terror in which Azawad was transformed served to create synergies among jihadist groups that facilitated the commission of major attacks against industrial or tourist objectives such as the assault on the In Amenas gas plant in Algeria or the hotels of Ouagadougou, Bamako or Grand Bassam in Ivory Coast in the period from 2013 to 2016. 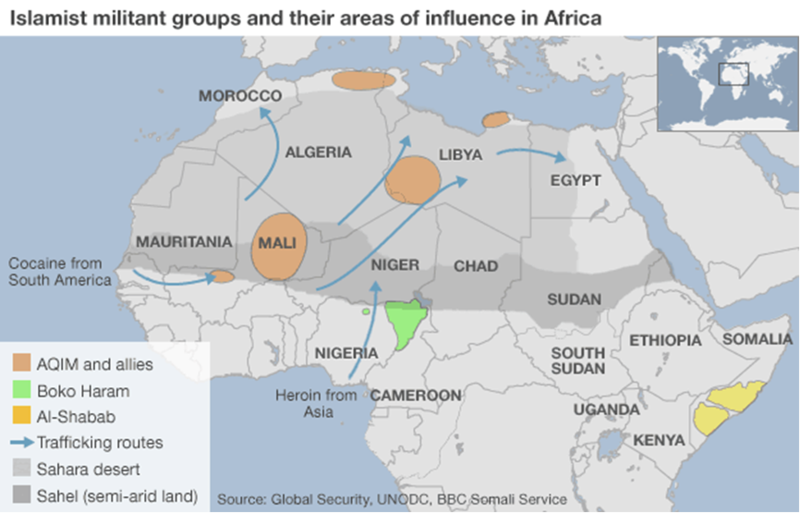 The joint action of tribal militias, national armies of the region such as those of Chad, Niger, Mali or Senegal, the continuous sending of troops from France and the help in intelligence or delivery of material by countries such as Italy, Spain or Germany it has not slowed down the progress of the different jihadist groups operating in the Sahel and is unlikely to do so in the near future. Currently, the jihadist presence is no longer limited to northern Mali (Azawad) but rather that Al Qaeda through JNIM is being implanted in places where its presence was occasional, such as the center of Mali, the Mauritanian desert, and the western provinces of Niger, Ansarul Islam has broken into the west of a Burkina Faso that until a couple of years ago was unaware of jihadism and the Islamic State tries to link its Libyan branches with Boko Haram through the adhesion of minority groups like the remnants of the Mujao commanded by Abu Walid Al Sahrawi. 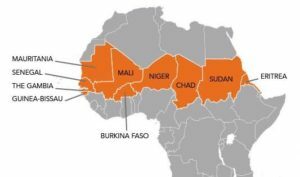 Looking ahead, the situation in the Sahel has no signs of improving, desertification has been progressing for years, resulting in a smaller amount of useful land and consequently a growth of violent conflicts between ethnic groups and tribes for the control of them. 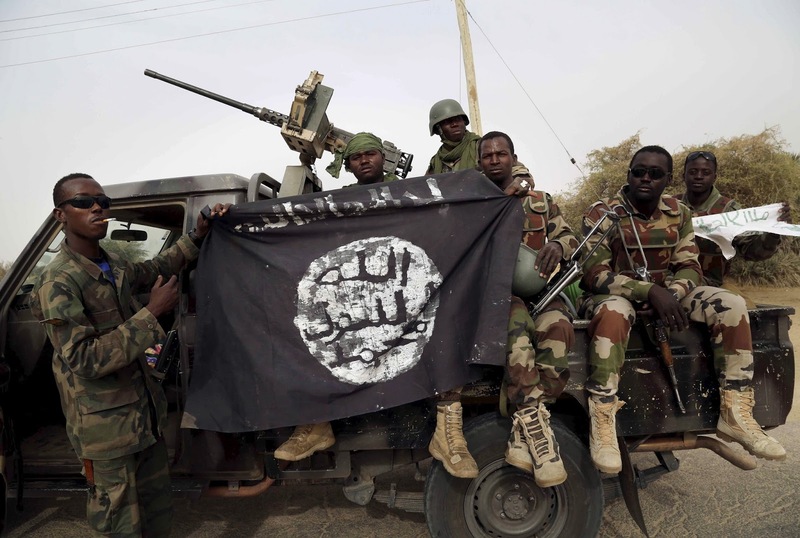 in Mali as well as in Darfur, Chad or South Sudan, as well as a great growth in the number of people who join jihadist groups either by ideology or as the only possible work outlet. A conflict of unknown scope is brewing just a few thousand kilometers from Europe if the region does not have the means to develop economically and its inhabitants can live with dignity, since at a given moment the localized ethnic conflicts may turn into a conflict regional as it happened in the Great Lakes area between Hutus and Tutsis or that the weakness of a state of the region causes its collapse and its place is occupied by JNIM, Ansarul Islam and Islamic State as happened in Azawad or parts of Syria or Iraq. Both in the first case and in the second or in a feasible union of both, a humanitarian emergency situation would be generated in an area where international agencies are already intervening to feed an increasing number of people due to drought and progress of desertification. A humanitarian emergency that, as in the case of Syria-Iraq, would be complemented by columns of refugees fleeing from hunger, conflicts and in search of a better life. The situation of a territory that can be considered the backyard of Europe has long gone unnoticed, but we may be in the antechamber of a catastrophe if we do not act quickly and with a head. Because even if the jihad is eradicated from the Middle East, it will not disappear from the earth but will seek new fronts and the Sahel is the ideal candidate with its permeable borders and weak governments, so that as soon as the Syrian conflict goes into solution thousands of volunteers from Al Qaeda and Islamic State will arrive in alluvium to resuscitate the unfinished work in Azawad. But it is that although there was no transfer of Islamic militants because the conflict in the Middle East was delayed, something as random and out of human control as a summer warmer than normal and / or a prolonged drought could cause a famine of greater proportions than the current ones, with such devastating effects or more than an interethnic conflict or a large-scale confrontation between armies and jihadist groups.